Fine Art Painter specialising in Still Life, Interiors, Venice, Jazz and Flowers. After the benefits of a traditional art education rooted in the principles of design and draughtsmanship, I am almost inevitably, a realist artist and the control of colour and light are still the fascinating daily challenges. When I concentrate on a Still Life or detail from a larger subject, I re-live the pleasure of close observation inculcated in my student days. For me, a Still Life is never a Nature Morte. When painted, even an inanimate object can express vitality. With interiors, I am particularly drawn to what is mysterious or suggested leaving a subliminal narrative open to interpretation by the viewer. Fortunate, for long periods, to have lived in Italy – particularly Venice – I have latterly made regular trips to Provence and Northern France. These experiences, and a lifetime’s love of Jazz, are obviously reflected in my work. Among artists, I readily admit to the influence of Wyeth, Tindle, Hopper, Caravaggio and Vermeer. 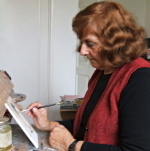 I left a career in secondary education to become a part-time lecturer and to concentrate on etching and painting. Copyright © Maddalena Pacini. All rights reserved.